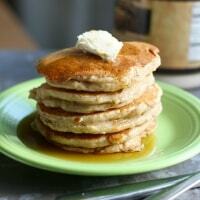 Home » Breakfast » Fluffy Vegan Banana Pancakes. Vegan banana pancakes are fluffy, light, and full of sweet banana flavor. These are perfect for a weekend breakfast! Is there anything better than a pancake breakfast on a Saturday morning? Yes, there is…a vegan pancake breakfast. 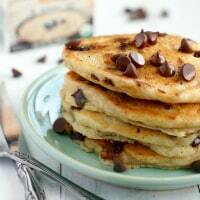 A family favorite: vegan chocolate chip oatmeal pancakes. We make pancakes regularly here, but we were in the mood for something different, so vegan banana pancakes made an appearance on the menu. All it took was defrosting an overripe banana from the freezer, adding it to the batter, and we had a nice stack of egg free pancakes for breakfast. You might wonder if the very ripe banana would make the batter too heavy, but these vegan banana pancakes were very light and fluffy. They had just the right amount of banana flavor – it was there, but not overpowering. Both of my boys loved these, so I’ll be making them again soon. To make sure that these easy banana pancakes get done in the middle, you want to cook them low and slow – keep the heat on low. I know it’s hard to do when you want your pancakes in a hurry! But it’s necessary. I have an electric range so I kept the burner set at about 3 or 4. They take a little longer to cook, but they turn out perfectly golden brown and tender. You may wonder if these vegan banana pancakes can be made without milk. Yes, you should be able to make them with water, and it won’t change the flavor. The texture may be slightly less tender, but they will still be good! It’s okay to use water if you are in a pinch. These vegan banana pancakes are a perfect weekend breakfast! Light, fluffy, and flavorful. In a large bowl, mash the banana. Add the canola oil, vanilla, and non-dairy milk. Stir to combine. Add the white spelt flour, sugar, baking powder, and salt. Mix together. Place a tablespoon of vegan buttery spread in a large skillet, and heat over medium low heat. Once the pan is hot, spoon the batter into the pan. Cook the pancakes low and slow, it may take about 3-4 minutes on each side. 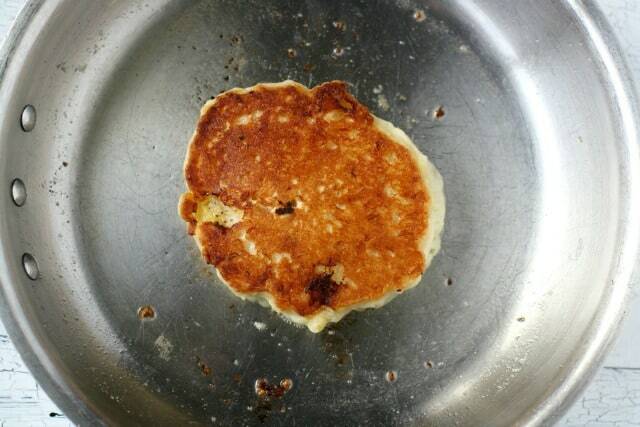 Once the pancakes are done around the edges, flip them over. Cook for about 3 or 4 minutes more, then remove from pan. Repeat with remaining pancakes. Top with butter and syrup. Vegan apple cinnamon pancakes are perfect for fall! These pancakes are so easy to make and so perfect for weekend breakfasts! Kids and adults love these. 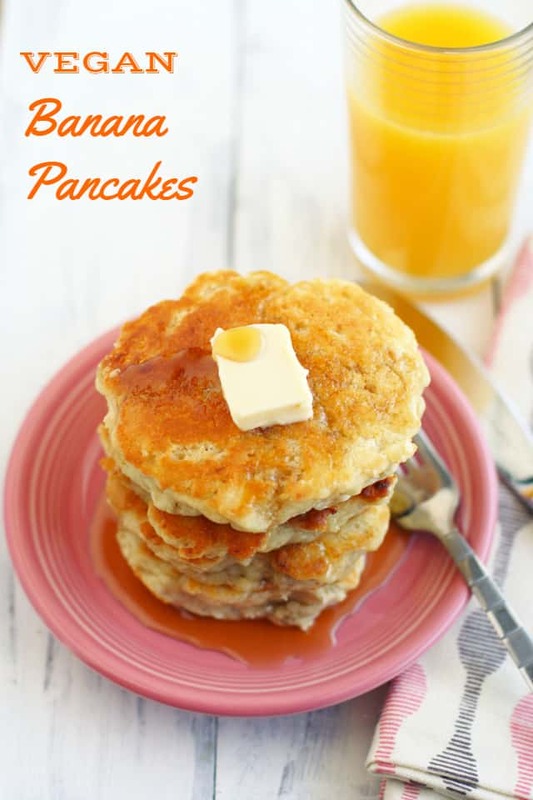 Make sure you wait a few minutes for the baking powder to make the batter puff up – that’s what makes these pancakes nice and fluffy. When you are ready to fry them, use a fair amount of vegan buttery spread – you don’t want any pancakes sticking to the pan! Don’t raise the heat too high or these might burn from the sugar in the bananas. 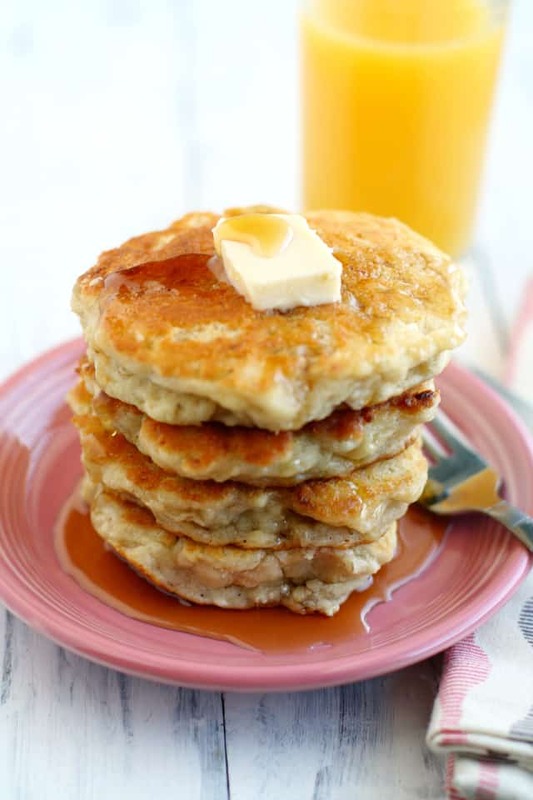 This article has some more general tips on how to successfully make pancakes, and if you’re wondering about reheating these or freezing pancakes, this is a good resource. 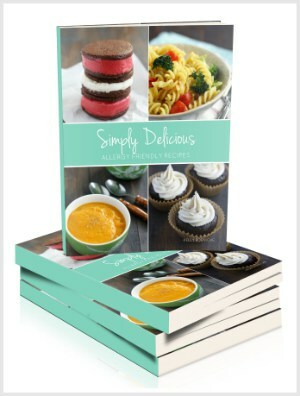 Follow The Pretty Bee (Allergy Friendly Eats)’s board Egg FREE Breakfast Recipes. on Pinterest. « Pasta with Creamy Kale Sauce. So happy you liked these! And I’m glad to know that it worked out with the GF flours! This is my go-to pancake recipe. I make the batch, eat two at a time and freeze the rest for a quick and delicious breakfast (my batches make about six). A minute in the microwave on one side, then 30 seconds on the other perfectly defrost these pancakes when frozen. I use a cast-iron crepe pan, so I don’t really need the buttery spread as as long as I preheat the pan. Thanks so much for making my breakfasts easier and more delicious! So happy you like these! Thank you for letting me know! Freezing them is a great idea! So glad you love them! Thanks for telling me! So good! Better than non-vegan pancakes! Thank you so much! Yay! So glad you love these! Thank you for letting me know! These are delicious!!! I omitted the sugar and vanilla extract since I used sweetened Vanilla Ripple milk. I’ll definitely be making these regularly. Thanks! These are the best pancakes I’ve ever had! They are so good and fluffy. I used almond milk and coconut oil. Definitely will be making these a weekly breakfast meal. Thank you! So glad you like them! Thanks for letting me know! Super easy and very tasty. Great for using up an overripe banana. My 1 year is not vegan but she cannot eat eggs so this recipe was right up our alley. We used whole wheat flour and dairy milk. Due to the flour change we needed a bit more milk. The pancakes turned out grey, fluffy and crispy. If I continue to use whole wheat flour I’ll probably just add even more milk than I originally did it as the pancakes were a little bit soft on the inside rather than done. Side note the banana flavor and even when I mixed in frozen blueberries were fantastic and my kids love them. So glad you liked these! Thanks for letting me know! Haven’t tried it yet but I am definitely tempted. Do you think this would work if, instead of frying in the pan with vegan spread, I would simply put them on a non-stick gridle, withotu any oil or buttery spread? I make pancakes from a different recipe like this and they’re fine (there is buttery spread in the batter), just not what I would call fluffy. Second question is, can whole wheat flour be used instead of the spelt? I don’t know for sure, because I have not tried them without something to fry them in. If you do try it, please let me know how it goes! You can use whole wheat or white flour. We made these for brunch this morning. Subbed the coconut milk with soy milk and the spelt flour with a gluten-free mix, but still super delicious! And crazy fluffy too! Thanks. These look great! I’m just about to make them for breakfast but I don’t have white spelt (only regular spelt) but wondering if I could use kamut flour instead of spelt? I’ve never used kamut flour, so I’m not sure! But regular spelt will work fine! I am cooking these as I’m typing, I just finished taste testing my first one and I have to say these are the best pancakes I have ever had(vegan or not). My mind is blown, thank you so much for sharing!!! I’m so happy to hear that! Thank you for letting me know. Thanks for this amaing recipe! Do you think it’s possible to use agave vs sugar? I made these today and they were super yummy! Thanks! So glad to hear that, thanks for letting me know! Yay, so glad you liked them, and thank you for sharing! Yay! I’m so happy to hear that, thank you for letting me know! Hey, the Trevor suggests using 1.5 tablespoons of baking powder. This seems really high. I reading this right or should it be teaspoons? Hi, just made this recipe. 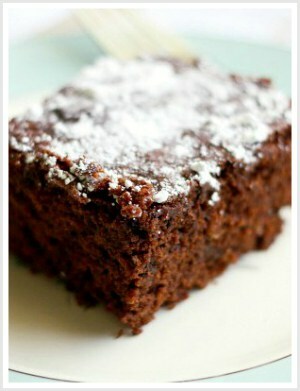 They looked amazing, but had this really bitter baking powder taste – I used 2 teaspoons. Nobody else had this problem? Will have to cut down on them next time, but love the recipe otherwise! Great tips. Maybe it was the brand of baking powder? I haven’t experienced that! Sorry you had that issue! I have not yet made them but I was wondering if I would be able to premake the batter and refrigerate it so I could make them the next day? Nope, because the batter will deflate. The baking powder causes it to rise, but you do need to cook them right away or they won’t stay puffy. Thanks for the recipe. These are so good. I used gluten free flour and coconut oil and they’re ace. Also just finished a chocolate batch where I added 1/4 cup of cocoa powder and a touch more coconut milk and they were amazing!!! Better than most non vegan pancakes, super fluffy! Yay! I love your variations! 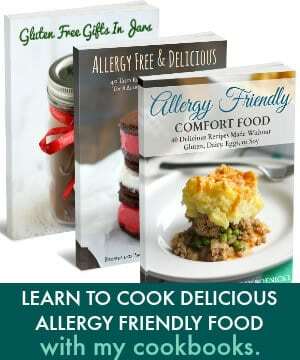 My Husband and Mom have many different allergy issues…. 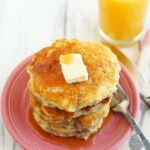 can I use Sweet White Sorghum flour for these pancakes? I haven’t tried that, so I don’t know if it would work. Let me know if it does! Made this yesterday morning! So delicious! They were very light and fluffy! I used heart shaped rings just because, which was appropriate since I fell in love with this recipe. Only I used almond milk instead of coconut and almond extract instead of vanilla… Only because that’s what I had on hand. Will be making these yummy pancakes for years to come! Made them this morning using all-purpose flour and Silk unsweetened vanilla almond milk. FABULOUS! Hubby and I agree this will be our go-to pancake recipe. Thank you! The pancakes turned out great! Substituted Coconut oil for rice bran and still ok. The quantity was only just enough for 2 of us reasonably little people though (4 pancakes) , not sure how to get 6-8 serves out of it! I just made these and they were the best pancakes I’ve ever had period. Including French crepes in France, Swiss Kaiserschmarren in Switzerland and all kinds of other decadent variations of a classic pancake. Definitely beats the standard American pancake by a LONG shot. Btw I forgot to add the oil and it turned out amazing anyway. I just made these about an hour ago and they were amazing! It was really easy to make and it was filling! I replaced the canola oil with olive oil and the coconut milk with almond milk instead. Awesome! I’m so glad you liked them! Thanks for letting me know! These are the first pancakes that I have ever made that turned out like a unicorn spoke magic beauty dust into their hearts. I mean,they were AMAZING ! No one expected them to be vegan and im pretty sure someone in the room died cos of shock. I just want to say thank you for blessing my life though,haha. I made these this morning and they were great! I sprinkled cinnamon and a little honey on top which was fantastic! We made them this morning. Delicious!!! Added a 1/2 tsp of cinnamon on a whim; it works :) Thank you for the great recipe! I’ve been obsessing with bananas lately and just made banana waffles- Need to try this! Pinning! Your weekend sounds like my favorite kind of weekend! These pancakes look perfectly light and fluffy. 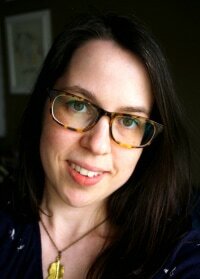 Your photos are just gorgeous! We all need a good banana pancake recipe in our arsenal! Your food photos alway look so appetizing; these are no exception. Pinning. I made soft tacos and guacamole. It was a good weekend! Thank you so much, Diane! :) Oooh, tacos sound really good right now! I sang Banana Pancakes by Jack Johnson while I was reading this post. I’m a huge pancake girl, and even better if there are bananas in them! Yummmmy! yum! I love adding naners to my pancakes! These look so fluffy and delish! Goodness! That’s a long time without pancakes! Let me know if you try these! These look lovely – in the recipe it says 1 3/4 White Spelt Flour – but 1 3/4 what? ounce? tablespoon?? Thanks for catching that, Lorna! It’s 1 3/4 cups of white spelt flour. I’ve corrected it now! Thank you for letting me know – My little man loves pancakes and bananas so I am going to make these for him tomorrow. These pancakes look perfect, Kelly! I love the banana flavor, sounds delish! I could proooobably eat pancakes every day of my life and not get sick of them.LOVE these beauties and the fact that they’re vegan! Well played, sister!